A Straight Key is what you see in old western movies when the sheriff goes to the telegraph office to send a telegram asking that the circuit judge come to town because some justice needs to be provided. The telegraph operator will then pound out the telegram on an up/down “straight key”, which leads to the term “pounding brass”. I can do OK with this key up to about 20 WPM, but my wrist feels like it will fall off my arm after about a minute of sending. A Semi-Automatic Key (also called a BUG) is a mechanical contraption with a horizontal pendulum at the end of a piece of spring steel. Pressing the lever sideways will cause the pendulum to mechanically oscillate back and forth, with an electrical contact closing at one end of the arc of the pendulum, causing a dot to be created. These have been around for over 100 years. I have a 1963 version that my Elmer sold to me for a good price. It looks very cool on my radio table. It looks very cool in operation on my radio table. But my sending is awful on this type of key (it’s me, not the key). Iambic Keys have two key contacts and are constructed like two delicate straight keys mounted sideways, with paddles that oppose each other, with the two key contacts connected to an electronic keyer. Press right and it makes perfect dots; press left and it makes perfect dashes. All is good up to this point. But the person who thought up this system also thought it would be very cool if, when the user squeezed both paddles together (thus closing both switch contacts at the same time), the keyer would make alternating dots and dashes for as long as both paddles were squeezed together. Seems like a good idea. For many people it is a good keying option. But not for me. I make a lot of mistakes with an iambic key. And that leads to the single lever key. It’s a single lever that moves side to side, with one set of key contacts that make when the lever is pushed right , and a second set of key contacts that make when the lever is pushed left. It too, like the iambic key is connected to an electronic keyer. Press the single lever right and it makes perfect dots; press left and it makes perfect dashes. Functioning just like the Iambic key connected to an electronic keyer. But that’s all it does. The single lever is just that, single. It’s not possible, mechanically, to close both key contacts at the same time. So if you “squeeze” the lever, nothing happens; it’s moving the single lever left or right that makes the keyer operate. I love this setup. Not as cool as an iambic keyer, doesn’t have the cachet of a bug key with the mechanical vibrating pendulum, but I don’t make anywhere near as many errors with this key compared with an iambic key or bug. The single lever key that I use is a Vibroplex Vibrokeyer that I found on Ebay for a very good price. Here’s what the Vibrokeyer looks like, from the Vibroplex website. But it’s not just me. 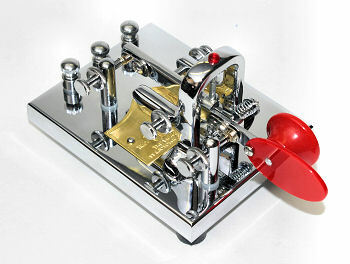 I’m hardly a good CW operator, but in doing some Googling, it seems that many high speed CW operators who use a telegraph key seem to prefer a single lever key over an iambic key or bug.